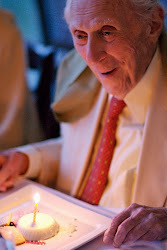 Today would be Roy R. Neuberger's 109th birthday. To celebrate, I am happy to (finally) share a presentation made by my uncle Jim Neuberger (Roy R. Neuberger's son.) This slideshow is part of the memorial service below, but to make it easy to view I have added it on it's own here. Enjoy. Happy Birthday Gpa Roy ! The memorial service for Roy R. Neuberger was held on Sunday, 13 March 2011, at the New York Society for Ethical Culture in New York City. RRN's 1st memoir - "So Far So Good"
RRN's 2nd memoir - "The Passionate Collector"
© 2011 Matthew London. Awesome Inc. theme. Powered by Blogger.